Most technologically advanced car in its class with customizable digital gauge cluster display and the 8.4 UConnect touchscreen. The Dart, replaced the Dodge Neon, is modeled after the Alfa Romeo Giulietta. Updates to the Dart include; a 16-inch aluminum wheel on SXT models and a black and ruby red interior option available with the Blacktop packages. There are now nine exterior color, including three additional colors: Passion Red, Laser Blue and Vitamin C (orange). The Dodge Dart lineup is fine tuned for 2015 to deliver even more value, style and performance than ever before. Pick your poison with choice of 2.0-liter four-cylinder 160 horsepower and 184 pounds-feet of torque, that can be turbocharged or a 2.4-liter Tigershark MultiAir2 I-4 engine, which produces 184 horsepower and 174 lb.-ft. of torque. Both engines can be harmonized with either six-speed automatic or six-speed dual-clutch transmission the six-speed automatic. The 2015 Dodge Dart lineup has been fine tuned to deliver even more value, style, and performance. 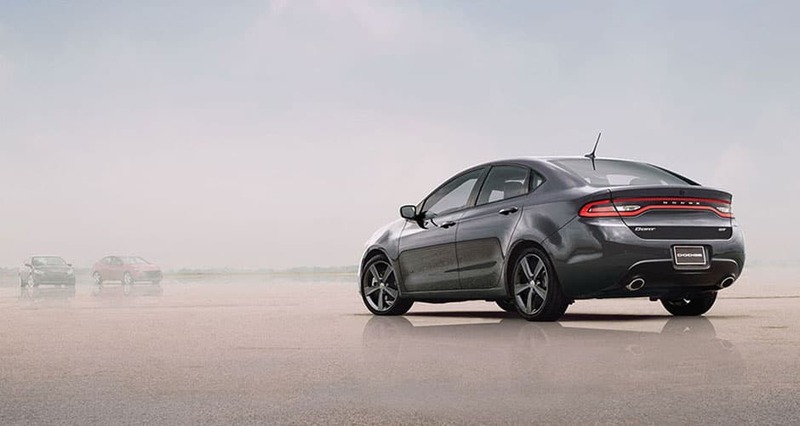 The 2015 Dodge Dart retains its distinctive style with an athletic, stylish exterior design enhanced with the signature race track LED tail lamps; a modern, sleek interior design. Well-crafted with high-quality materials and attention to detail; class-leading safety and security features, including 10 standard air bags; class-exclusive, easy-to-use technology and steering, ride and handling and dynamics engineered for all who loves to drive. Leader of customization with your choice of 17- or 18-inch wheels and different grille styling varies by trim level, heated side mirrors, power sunroof, and dual exhaust tips. Your ride your choice of what you want to keep you comfortable, content, and safe. The Dodge Dart is loaded with more than 60 available safety and security features that give drivers and passengers' peace of mind. Front airbags, antilock brakes, and an electronic stability system are a few of the safety features. Constructed of 68 percent high strength steel, the Dodge Dart's can handle an impact. Other available safety and security features include a class-leading 10 standard air bags, four-wheel anti-lock brakes, electronic stability control, electronic roll mitigation, all-speed traction control, ParkView rear backup camera, Blind-spot Monitoring, Rear Cross Path detection, ParkSense rear park assist with dynamic grid lines, LATCH anchors, which allow a child seat to be placed in any of the three rear seat positions, and much more.